In recent weeks, I have read a lot about how the economic growth of Brazil has made it possible to Brazilians to travel abroad more often and enjoy perks that were considered luxuries not too long ago. In a New York magazine piece, New York mayor Michael Bloomberg was quoted as very happy that tourist from Brazil were here spending their “reals” alongside Japanese with their yens and Europeans with their (suffering) Euros. 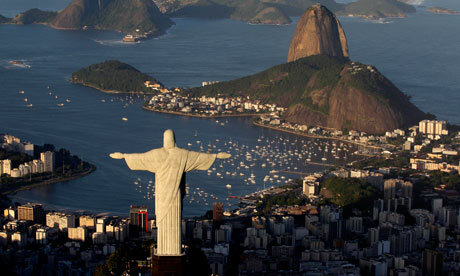 More recently, The New York Daily News mentioned a ‘surge’ in tourist visa applications from China and – yes, Brazil. Finally, yesterday there was a piece on the New York Times about a current Brazilian ‘invasion’ in South Florida, where successful visitors can walk around in their Gucci’s and Prada shoes without having to worry about being victims of the violence they face in cities like Sao Paulo and Rio de Janeiro. While I am proud of Brazil’s incredible accomplishments in the past decade (who would’ve thought they’d surpass Great Britain as an economic giant? ), the truth is that there is still a lot to be done. One thing is to at least reduce the gap between the have and have nots – something that Brazil’s upper classes are not really looking forward to. There is a lot of social injustice there, and this will only end if the same classes that now flood our streets as tourists realize that they have to be open for it. There are many upper middle class fellows there who are not too happy about the educational programs promoted by the government that have helped to lift its lower-wage citizens out of poverty. I once mentioned here about a friend who was ‘shocked’ that her cleaning lady was taking computer lessons – after all, house servants have gone from generation to generation doing exactly that, and now that this generation is finding a way out of it, the upper middle class is scrambling with the prospect of no longer having anyone to pick up after them. Also, urban violence is a problem that has not improved – in fact, it has worsened. While I have been lucky enough to never have been the victim of a mugging or anything like that (my bicycle was stolen once, but that happened in Greenwich Village in front of a church), I am well aware of how dangerous big cities have become there. For instance, two years ago I was walking down Beira Mar Avenue in Fortaleza at around 1 AM and a TV reporter stopped me to ask if I wasn’t ‘reluctant of roaming the streets at that time of night.’ On this year’s visit, a friend insisted in driving us home just a few blocks because she was afraid we’d be accosted by opportunists – and this is in Fortaleza, a city that is comparatively safer than larger cities like Rio or Sao Paulo. Cost of life is also an issue. During our last visit, we spent a few days in my mom’s apartment, so we didn’t have to go to restaurants – I would go to the supermarket across the street and purchase groceries as needed. It was scary to see how expensive food has become there – food costs almost as much as it does in the US. The same goes with real estate. As the NY Times mentioned, Brazilians are buying in Miami because the costs are much lower than in Brazil. In the end, while I praise the country’s accomplishments of late, I do have to say that there is a lot of room for improvement… I hope they get there soon enough. Enjoyed this post a great deal. We have a lot to do here in the US as well. Though our middle class is huge, it is under tremendous pressure and shrinking every year due to inflation and and salary stagnation. Honestly if things dont change – the attitude towards government programs and the pro-business politics right now, I doubt we will have a middle class at all in the next few generations in the US.